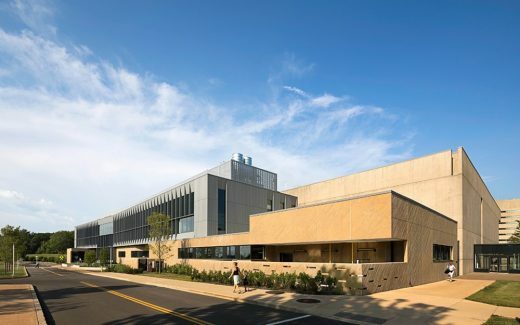 The New York’s State University Construction Fund hired architects Deborah Berke Partners to design a significant addition to and a dramatic reconceiving of a 1968 I.M. Pei arts complex on the State University of New York’s Fredonia campus. 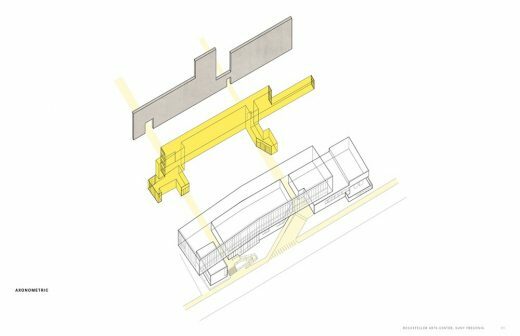 Deborah Berke Partners Architects created a linear addition at the west façade, allowing the former back and service side of the building to become the new primary entrance. 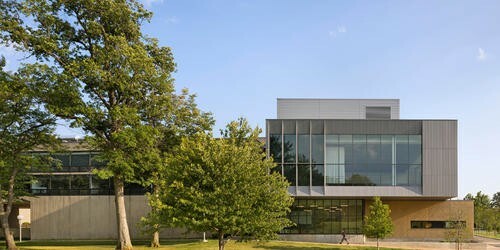 This strengthens the building’s connection to the campus and reinforces the role of the arts at the institution. 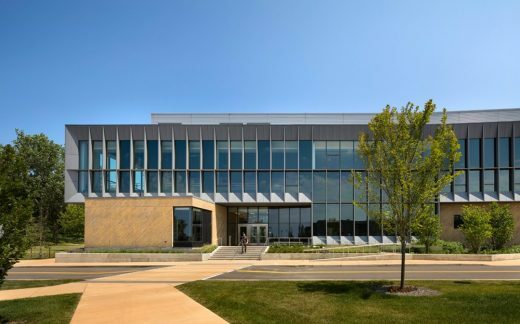 Our design respects the austerity of our Pritzker Prize-winning predecessor’s building but uses a strategy of subtle contrast to update it to meet contemporary needs. The architects inverted the existing material language of long concrete walls by employing a palette of zinc metal and glass walls with accents of concrete details. Metal fins provide sun shading and add texture and depth to the facades. 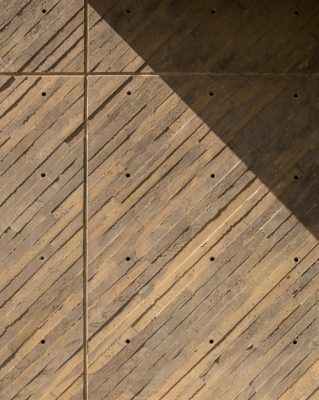 Recognizing the history of cast-in-place concrete construction on campus, we worked with local contractors to develop distinctive board forms with diagonal striations. This pattern differentiates our work from Pei’s. 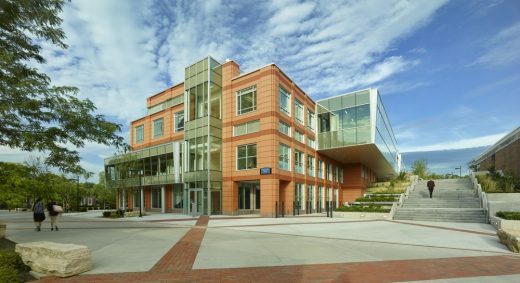 Our 60,000-square-foot addition includes classrooms, sculpture and ceramics studios, performance spaces for music and dance, and a variety of shops and other shared facilities, including areas for set design and construction. 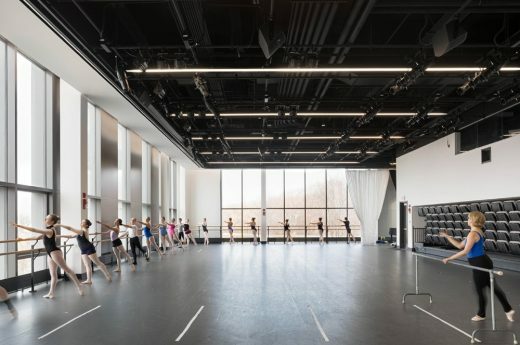 The building’s sun-filled dance studio has floor to ceiling window walls, which allow rehearsals to be visible to the campus, and turn the building into a beacon at night. Corridors are lined with tackboard surfaces, so they double as critique spaces and informal galleries. Ceramics studios and workshops are unadorned and designed for the heavy use of art making. General Contractor: Northland Associates, Inc.